Yup – these really are sour grapes. Cheek-suckingly, eye-wateringly sour. They even look mean, no? This, basically, is verjuice’s (verjus, for all you francophones out there) Mummy. The real deal. 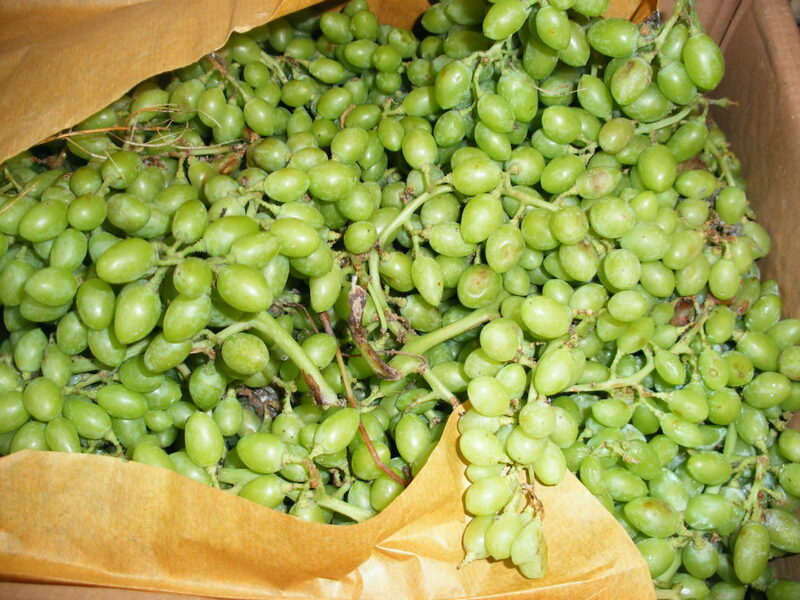 In Iran sour grapes are known as ghooreh, and verjuice as ab ghooreh, and they are a really important part of the cuisine. The season is awfully short (a few weeks in June/July), but the grapes are pressed, dried and ground, frozen and pickled so that we can enjoy their sharp goodness all the year round. Here are a few ideas on what to do with the stuff should it swing by your pantry/fridge. Verjuice: i.e. the juice extracted from sour grapes. This finds its way into all manner of khoreshts *(or casseroles), and is somewhere between wine and vinegar in application. It is also used in salads in Iran, and is reputedly good for lowering high blood pressure/cholesterol. Strictly speaking it doesn’t need the fridge once opened: if you have a bottle, don’t be alarmed/go all squealy if it forms a king of must on top: just flick the mould off and carry on using it. Sour grape powder: use like a spice – add to dishes at the sealing frying stage. It will add a lovely sharp zing to soups and stews. It is also great in marinades for fish and meat. Pickled Sour Grapes: apart from making a perfect gift for your mother-in-law (Les Dawson where are you now? ), these can be dropped whole into casseroles/sauces to lend a dish little explosions of sharpness. You can also crush them into salad dressings and stuffing. Fresh or frozen: fresh ones (like the ones THAT-WE’VE-GOT-IN-THE-SHOP-RIGHT-NOW-PLEASE-FORM-AN-ORDERLY-QUEUE) need to be washed well and picked through. Detach them from their stalky bits, and then just plop them whole into salads, casseroles etc. Glorious – and they will keep your dinner guests guessing. Now is a good time to buy them to freeze as well: you can use them straight from the freezer. Silly serving idea: they are quite fun dropped whole-frozen into Martinis. That should give you something to be going on with. If you are popping by the shop this week, do stock up: these are a real culinary treat. Aha,so the season is short. This explains why medieval Arab recipes regularly call for hisrim yabis, dried sour grapes, which would have been the only kind available most of the year.